User Listing & Profile add-on lists all the users of a website where WP User Frontend Pro is installed. The list is shown on the front-end of the site.You can use this add-on to create a table of lists that show all the users of the site. It is also customizable so you can set what fields to show and which roles can see which fields. You may also add additional fields from the backend of the site to be shown on the front-end user listing. 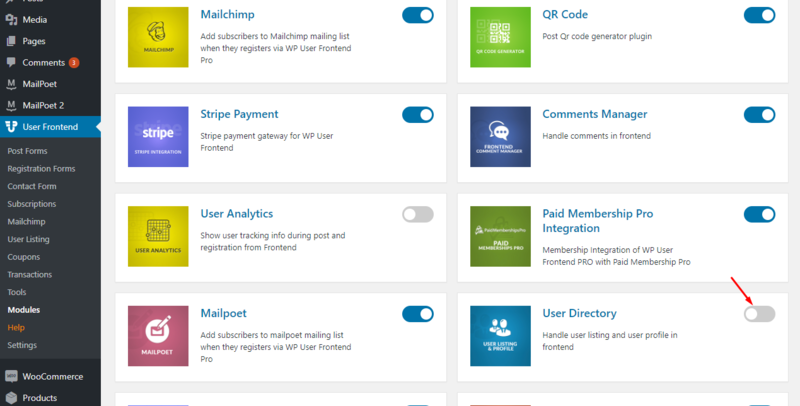 Navigate to your WP dashboard->User Frontend->Modules. Find User Directory and turn on the toggle button on the top right to activate this module. 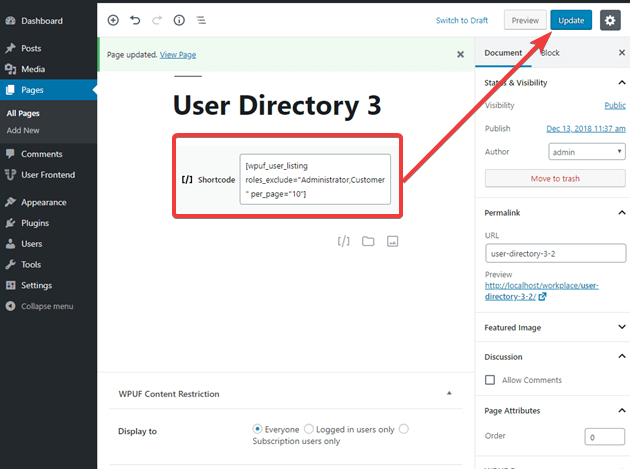 When you install the User Listing & Profile add-on, you will notice a User Listing sub-menu under the User Frontend menu in your WordPress dashboard. Refer to the image below for an overview of what each section does. This is where you will find the settings of User Listing & Profiles add-on. This checkbox enables/disables the avatars of the users on the User Listing page. If you turn it off, users' avatars will not be displayed. By default, it is turned on so that user avatars show up. These are the fields that will be associated with each user and will be shown on user profile. When in User Listing page, users can click on the View Profile link to see a full profile of the user. Every field from this page will be shown on the user profile. However, you can choose which fields to show in the User Listing table and which fields to hide from the table. As you can see in the screenshot above, turning this checkbox off makes this particular field hidden from the User Listing table. Furthermore, you can also choose the roles that are needed to be able to view the profile field on the front-end. The roles are customizable on a per-field basis, so you can really customize it to your needs. If you want to add more fields than the default ones, you can simply click in any of these buttons and you'll be able to add as many custom fields as you want. 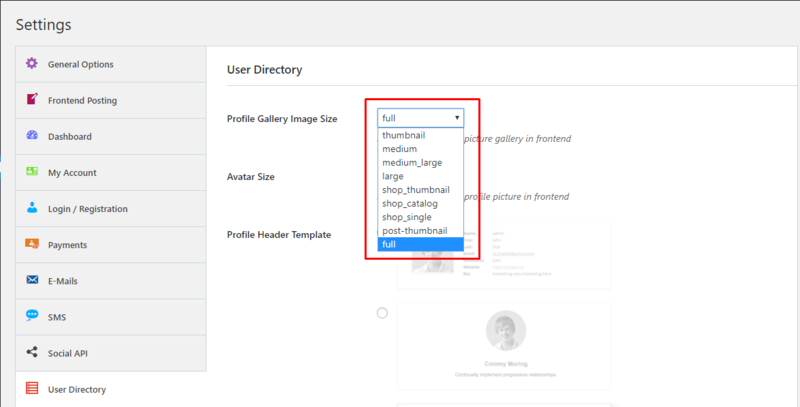 Admins can now select among different built-in design layouts for all user profiles and user listings. 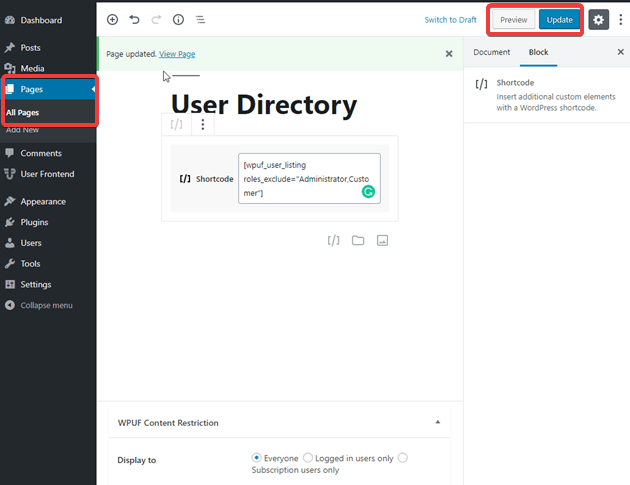 To do this navigate to wp-dashboard->User Frontend->Settings. To change the Profile Gallery Image Size choose from the dropdown as shown below. To change the Avatar Size, select a size from the dropdown, as shown below. To change the Profile Header Template, choose one from the 3 predefined templates given, as shown below. 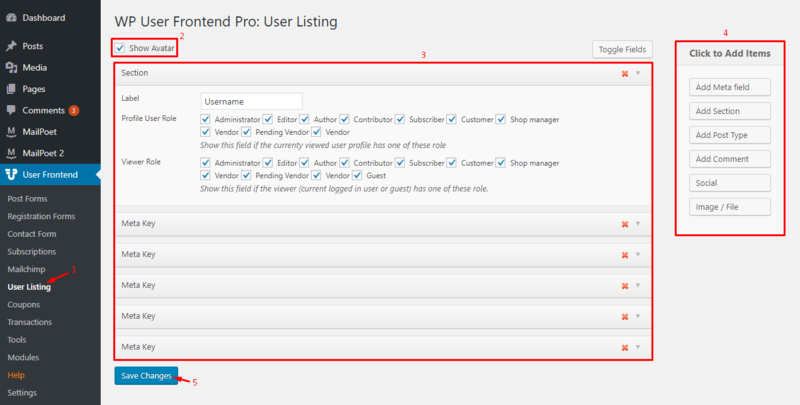 To change the User Listing Template, choose one from the 6 predefined templates given, as shown below. Then publish the page. The User Listing table will be shown in this page. P.S This code will show all the users in your site to everyone. Now if you navigate the frontend of your site and go to the user listing page as another user other than as an admin. The User Directory will show everyone in the list on frontend. 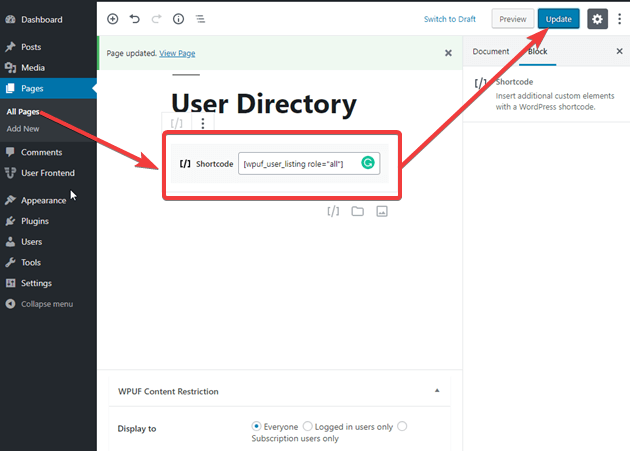 As an admin, you can also limit the certain category of users from the directory list. This will depend on the admin configuration. For example here in this user list Elaine Benes is an administrator. If you enter the following shortcode in place of the previous one it will limit certain viewing capabilities. P.S In this shortcode if you can change the roles that will be excluded. Such as vendors, editors, subscribers etc. In the same way, you can limit the number that will be shown on one page with the code below.